US, 1959, 104 minutes, Black and White. Rod Steiger, Fay Spain, Martin Balsam, James Gregory. Al Capone is another of those films which portray some of America's most attractive yet repulsive characters, the gangsters. 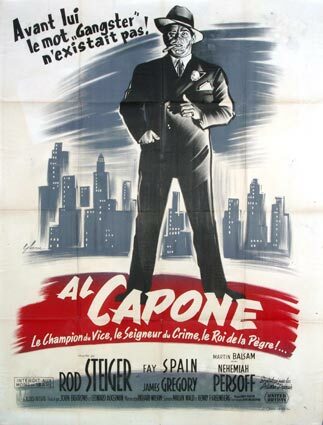 Films in the early 1930's brought the exploits and brutality of men like Capone to the cinema audiences of the depression. Some of the best techniques of sound action films were developed in these movies. They began a tradition that moved through the developments with actors like Edward G. Robinson, Humphrey Bogart to the countless B grade gangster pictures of the 40's and 50's. Finally they were given the satirical treatment in Billy Wilder's hilarious Some Like It Hot (1959); since then they have given way to a revived interest in Private Eye films which are even slicker and in wide screen colour. One of the features of the early 30's gangster films was the moralising that was included in the film or in wordy inserts at the beginning or end of the film. Those times, with lawlessness and official corruption, seem hard to believe now, but they were contemporary history then and the authorities were worried about their effect: that they would attract and dare people rather than repel them. 1. Was A1 Capone in any way likeable? How do you explain his career, a strong personality, love of power, love of money, clever manipulation of people, deceit? 2. Did Rod Steiger's acting convince you that Al Capone was a real person and could believably have done what he did? 3. What was the role of the girl ? did she show that Capone was in some ways humane? How do you explain her living with him? Did she really believe that he did not kill her husband? Why wouldn't she let Capone see her child? 4. What are your views on brutality and murder after seeing this film? 5. Do you think that prohibition (of alcohol) was a good and practical government policy? What do you think would be the results of total prohibition? How did Capone and his men exploit this situation? 6. Why could Capone make an industry out of terrorising people, storekeepers etc., and charging them protection money? Why didn't the victims protest or appeal to the authorities to protect them? 7. What did the film say to you about legal and political corruption? How can anyone break a tightly organised syndicate for crime, extortion and protection? How did the U.S. eventually destroy these gangsters? 8. How true were the events portrayed of the 'The St. Valentine's Day Massacre'? Is such a slaughter possible or probable today? 9. Discuss the role of the corrupt newsman. How did he serve Capone? Why did he betray him? 10. Did you think that the commentary by the police chief was effective? Was it necessary? Why? Is it necessary to warn people continually about characters like Capone and situations like those portrayed in the film? Are there gangsters like this nowadays?